The first few months of kindergarten are exhausting, overwhelming and emotional – for the whole family. Here are my tips for helping your new school kid adjust to kindergarten and keep the tantrums and tiredness at bay. I’ve just sent my second-born off to school and I admit, there was an element of preparedness this time around. I know things that I didn’t four years ago and in the knowing comes confidence and assuredness. It feels good. But at drop-offs and pick-ups I’ve found myself answering questions from those who have watched their first-born walk into the classroom for the first time. These parents are flabbergasted by the tears (from their otherwise confident, outgoing children), the sheer exhaustion (“she slept 12 hours straight!”) and the emotional unravelling that begins as soon as their kindy kid gets home each day. I hold my hand on my heart when I say that my first year as a school mum was my hardest year of motherhood to date. I just wasn’t prepared for everything that went along with the 5 day a week routine. No one warned me! And for some reason I’d only heard about all the time that I would now have up my sleeve. Well that, my friends, is just a big fat lie. Don’t schedule extra-curricular activities for the first six months of school. This is a completely personal choice but let me tell you, I’m so relieved I made this decision at the beginning of the year. It’s not for everyone but it definitely serves us well. My kids are too tired adjusting to school to have energy for anything else, and basking in the free time after school and on weekends is definitely sweet. Plan an early dinner. Regardless of how much you child has (or hasn’t) eaten at school, it’s safe to say that they’ll be ravenous when they get home. The easiest way to deal with this hunger is to make dinner early (so they don’t fill up on snacks in the afternoon!). I usually serve dinner around 5:30pm which also means an early bath time and the chance to unwind before bed. If my little ones are hungry come 7pm, I’ll make a nutritious snack before storytime. Don’t overwhelm your Kindy kid with questions. I know, it’s almost impossible not to want to know every.little.thing about their day, but before long you’ll realise that they find it really difficult to articulate anyway. I find it best to nurture and gently guide them from school to home and (patiently!) wait for them to start chatting about their day on their own accord. Hugs and food and kind words do wonders for keeping tantrums at bay. Basically don’t have any expectations of them once the school bell rings – it’s easier that way. Get on-board with mental health days. If exhaustion has set in and you’re thinking of pushing through it… think again. 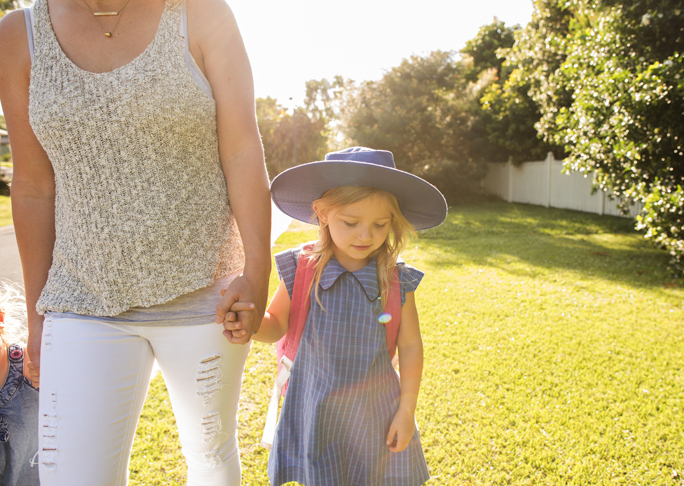 One day at home in lieu of school can be just enough to reset your Kindy kid and have them back to normal. This is particularly pertinent in the last weeks of term when weariness means you’re dragging yourself to the finish line. Plan no-plan days. The weekends are a blissful rest from routine and around here we like to keep it that way. Indeed, there’s a lot to be said for days with no plans. They’re so great for your school kid because they’re given the time and space to do as they please, without having to adhere to classroom rules, playground antics or the expectations of the bell.